If you are one of the many upper elementary teachers who incorporate some type of book clubs or literature circles in your classroom, you'll want to grab a cup of coffee and check out today's post! See if you might find a new helpful hint or idea to shake things up for your next round of book clubs! There are tons of decisions that need to be made before book clubs, aren't there? What books? Who will read each book? How will I decide? How much can they read each day? What reading and writing skills will we work on? What OTHER skills (cooperation, "accountable talk", technology, and so many more!). How can I get to each group and keep the other students working? It's no wonder teachers are tired! So let's think about how many different ways we can do book clubs--and this is just a sampling! And the list goes on! And more decisions...will you, the teacher, select the books for the students? Will the students select? Will you give the students a chance to give their input and then make the best decision for them as readers? Here is a set of books I used recently as we did "social issues" book clubs! I did book talks on all the books, then let students fill out a google form letting me know their preferences. I then made groups based on interest, reading skills with a nod toward groups I thought would function well together! So the first step is finished--NOW what? Time to plan! The first thing I do is reread my books a section at a time to make sure I know what talking points I want to make sure we cover--but the farther into the year we get, the less I do and the more I ask my STUDENTS to do! In fact, where many of my students had book clubs in third grade with specified guiding questions, I try to move my students gradually toward a more "grown up" book club by the end of the year. Instead of ME determining what they talk about, I make my students do it! After all, we have spent all year learning about the features of texts...how they are organized...how to get into characters' minds and critique their words, thoughts, and actions. We have predicted and confirmed predictions. We have summarized and looked for theme. We have compared and contrasted...you get the picture! We also reviewed how to make sure our BODIES look respectful in a book club...we want our eyes on the speaker, we don't fiddle with things or get off task, and we participate fully and encourage others to participate as well. I use the term "balance the power" to help students remember that being in a book club involves give and take, sharing the spotlight, and being an active participant. I have another post about this very idea HERE if you are interested! Once this is reviewed...it's time for my students to plan their book clubs! 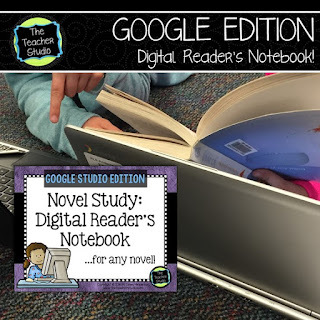 Sometimes I ask them to use sticky notes to jot down ideas that come to them as they read...other times they use their reader's notebooks--and, most recently--I've had them start to use "digital reader's notebooks" on their Chromebooks! By keeping their notes handy (no matter WHAT way you do it), students can learn to pause as they read to jot down ideas they want to talk about. This is new for some of them--they are more used to reading and responding after they finish. I want them to feel like this process is really interactive...I model using "think alouds" with the book I am reading aloud to show exactly how I pause when something captures my attention...something I am wondering about...or I want to make a prediction...or something shocks me...or I notice something about a character...or I think a character has said something important. Explicit modeling has REALLY improved the quality of my students' reflecting! After students have read their section and prepared their discussion ideas, it's time to put everything you've done into practice! I ask my students to sit in a circle and bring their books and their notes...I let them know that DURING the discussion is not a time to add on--that they need to have full attention on the group and the discussion. Earlier in the year, I am a part of the circle throughout the duration of the book club, but at this point in the year, I start in the circle for the first meeting or two--but as each group shows me that they are ready to roll independently, I back out and sit outside the circle. I still listen; I want to hear their ideas and watch for those accountable talk stems. I want to see how deeply they are comprehending and how well they are functioning as a group. I want to see that "balance of power"--and if I am NOT seeing these things, I can ease back into the circle for a while until I feel like they have made some changes. My favorite book discussions are the ones where I can just sit back and enjoy the discussion! After all, these kiddos are only 9 and 10 so watching them sit and chat about a section of a book for 15-20 minutes is pretty impressive, in my mind! "Check out the second paragraph on page 143. Why do you think Melody's mom said that?" So they need their books so they can follow along and chime in with their thoughts. This is particularly useful when students bring up confusing parts; all students can then refer to their notes AND the section of text so they can problem solve together. This is one of my favorite things to watch. Sometimes I need to jump in--but those accountable talk stems really work to help guide them without me most of the time! 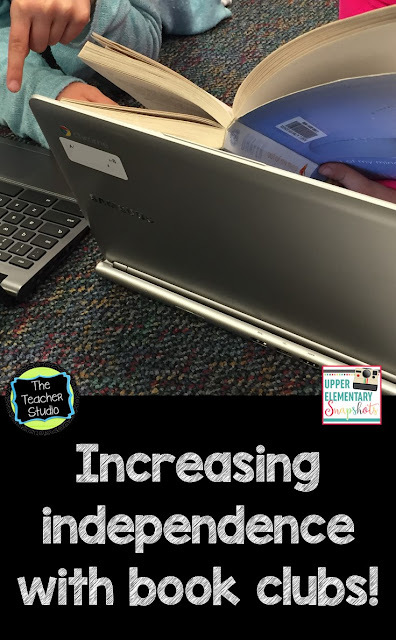 These students have all their notes on their Chromebooks with our digital reader's notebooks...so they might refer to their screen for those discussion ideas they jotted down as they read, and then move back and forth between their books and discussion. After the group meets, I always felt something was missing. Typically, the group meets, disbands, and then heads back to their desks to start reading the next section. I thought and thought about what I wanted them to do and realized that I wanted them to take the great discussions they were having and to DO something with them. Because this most recent round of book clubs was completed using a digital reader's notebook, I asked them to go back and spend 10-15 minutes adding on to their thoughts in their notebooks and writing a true "reflection". Where their book club PLANNING consisted of questions, bullet points, and small jotted notes, I wanted this reflective writing to be more thorough and complete. I wanted them to spend some time "synthesizing" the discussion and taking all the great ideas the group generated and recording them for later. This helps "capture" the great ideas as well as providing an authentic way for students to do some real-world writing. This is tricky for some students at first, so this is another time I like to model this type of writing with a chapter of a book I am sharing with a class. Here's the form I used with my digital notebook--but you could just as easily have them turn to the next page of their reader's notebook. So your students have spent a few weeks together reading, chatting, writing, and reflecting chapter by chapter. At this point, I want to see if students can put it all together. No, it's not time for a diorama about the book...it's time for more writing! I teach in a district where we grade on a standards-based report card, so I need concrete evidence about how students handle "theme", and summarizing, and character analysis. Watching them during book clubs is a GREAT way to get this information, but I like to have them finish things off by doing some writing COMPLETELY independently. Some students do like to rely a little too much on their group members, so this is a chance for them to really shine on their own. I ask them to write a short reflection about what they feel the theme of the book is. I ask them to write a short character sketch to show their understanding of a character of their choice. I ask them to write a paragraph stating and defending their opinion about the book. When they finish, the group reconvenes one more time to share their final findings. This is a great celebration of their work! I think it's so fun to watch the students grow as readers--and to watch them do it without me guiding every step! Interested in seeing the digital resource I mentioned? I am LOVING moving toward a more digital, reduced-paper classroom and can't wait to try even more next year! Thanks for stopping by--and I hope the end of your school year is filled with fun and learning!